Combine chicken with potatoes, carrots, peas, or other veggies in a foil packet and bake. This is an easy way to prepare a delicious meal. This is a guide about making baked chicken in foil. Tear 4 sheets of foil (about 24 inches or longer depending on the size of the chicken breasts). Preheat oven to 425 degrees F.
Place chicken skin side up on each piece of foil. Skin potatoes and cut into 1 inch pieces. Cut celery into one inch pieces. Add potatoes, celery, carrots, and frozen peas to each piece of foil with chicken. Place one tbsp of butter on top of chicken. Season with salt, pepper, and thyme. 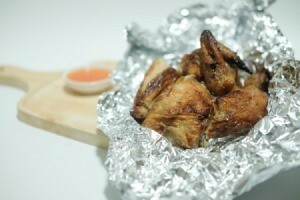 Bring ends of foil together and fold over until the foil is tight on top of chicken. Fold both sides of foil to seal chicken in foil. Place on cookie sheet and bake for 1 hour 15 minutes. Be careful when you open the foil, the steam is hot!